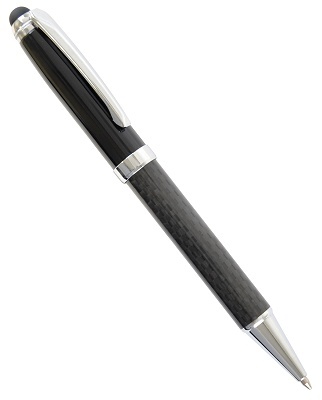 This lightweight carbon fibre pen is a touch stylus and ball point for any touch pad device including smart phones. 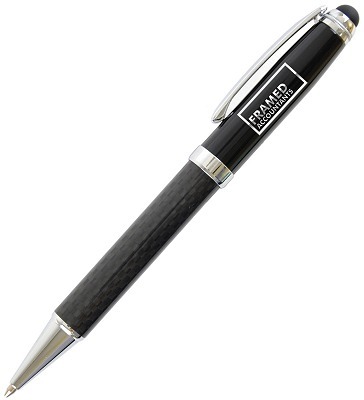 A twist-action carbon fibre barrel with soft stylus. The black top barrel is undercoated chrome and shows a mirror chrome finish when engraved. Pantone matching from only 1000 pieces. The touch stylus pen not only for iPad. 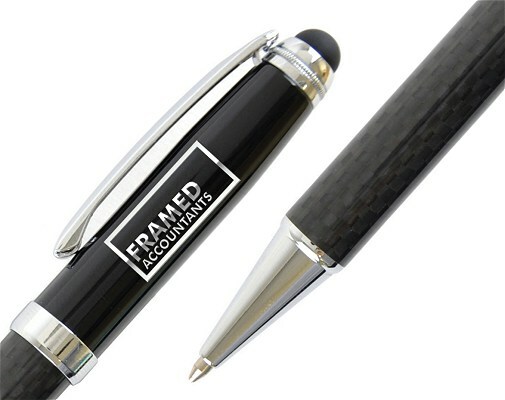 Have your custom logo printed on this combination of a stylish pen with a capacitive stylus for a tablet computer like an iPad or smartphone / iPhone. You can use it to write or touch. It is good for other devices! This is a capacitive stylus and it is perfectly suited to any device with a capacitive touch screen and that means iPod, iPhone, Android phone, PDA and Android tablet computers.